This Scottsbluff point was found in southwestern Montana in 1895 in a gold miners sluice box. Of its six previous owners, the second individual, A. Dr. Frank Linderman, wrote "It was found by a placer miner at considerable depth near Red Rock Lake, Montana in 1895. This prospector gave it to me in a saloon in Dillon, Montana in 1896". Virgil Russell purchased it in 1945 and wrote, "this is probably one of the finest Yumas ever found". Yuma was a name used in earlier years for several different types of Cody complex points. Scottsbluff points were named by C.B. Schultz and E.H. Barbour in 1932 for points of this style found with the bones of extinct bison near Scottsbluff, Nebraska. (Wormington 1957:118). 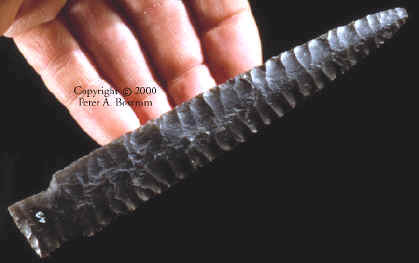 Scottsbluff points belong to the Cody phase approximately 8,000 to 9,000 years ago along with Eden points and Cody Knives. These people were Plano hunters who lived on the western plains and hunted the next largest living animals, after the megafana had disappeared, the bison. They hunted by "drive-hunting" where large numbers of animals were driven into box canyons or ravines where they could be trapped and killed.